For a luxurious and intimate cruise experience Gary Allen explores one of the world’s last great wilderness areas, the Kimberley Coast in Western Australia, on board a floating boutique hotel. There are many places in the world where the natural beauty is unique to those countries and regions. In Australia, we are blessed to have an abundance of these jewels. The Kimberley Coast is one of them. With more than 2,600 islands and 13,000 kilometres of coastline with its untamed and remote biodiversity, it is truly one the world’s last great wilderness areas. To truly grasp the scale and absorb the natural beauty of the Kimberley coast, you must get “up close and personal”. North Star Cruises is now providing the opportunity to experience this very special environment in stress-free luxury and style through its True North Kimberley Wilderness Cruises. North Star offers “luxury adventure-cruising” on the Australian, West Papuan, and Papua New Guinea coasts aboard the Australian-registered passenger ship True North. Cruises are often regarded as relaxing affairs where eating, drinking and napping is the order of the day – with perhaps a show at night. The True North experience is nothing like that. Accommodating just 36 passengers, True North is a floating boutique luxury hotel On this intimate luxury cruiser, no expense has been spared in terms of facilities, service, and catering to provide passengers with the ultimate travel experience with an edge. North Star Cruises is an award-winning Australian travel company and has been running luxury adventure cruises in the Kimberley for more than 25 years. 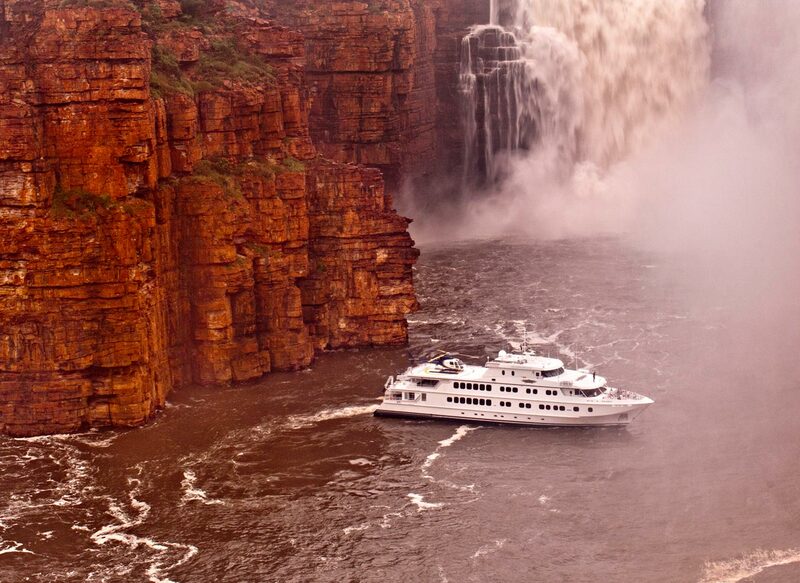 Their shortest cruise, the Kimberley Snapshot, condenses all the highlights of the region into a week-long voyage. 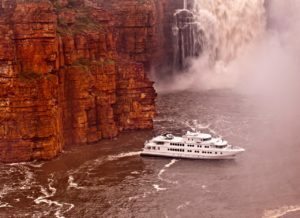 Embarking at Wyndham, the region’s oldest and northernmost town, the cruise takes in the spectacular King George Falls, the Hunter and Prince Regent Rivers, the incredible Montgomery Reef, and the famous Horizontal Waterfalls, before the run home to Broome. On board there are several vantage points to best take in the sights: a sundeck, forward observation lounge, the ship’s lounge and an alfresco bar. Sustainable, organic Australian cuisine is freshly prepared (often after being freshly caught!) and served in the dining room. There’s nothing like washing down the chef’s legendary oysters Kilpatrick (made with corn-fed black pig pancetta) with a glass of champagne while savouring a spectacular Kimberley sunset from the observation deck. Each day aboard the True North is filled with activities from the moment you wake. Of course, you can do as much or as little as you like, but the schedule is packed with excursions that allow you to venture off the boat. The activities are as diverse as the changing environment. The ship has six tenders that it uses to take guests on tours to see the local surroundings, as well as for fishing trips in the pristine waters. If you’re into fishing, then you will have plenty of opportunities to snag a prized barramundi. Even if you don’t get a “barra”, there are so many different edible varieties to hook in these bountiful waters. No luck with the barras for me, but I caught many others including a big barracuda, which was incredible fun to reel in. Most of our group fished at one point or another, prompting a convivial atmosphere each night when the crew would announce the best efforts of the day. Sadly, the coveted “Best Fish of the Day” hat never graced my head. Aside from fishing, there is a wide range of excursions available. Taking the tenders out to explore at sea level, absorbing all the sights, sounds and sensations is fantastic. Being a small ship, True North can get into bays, lagoons, estuaries and rivers that most cruise ships cannot, making the trip even more exotic. In many places, we were the only boat around, making the locations seem that much more remote. The crew organise hikes and other activities ashore to ensure there is always an opportunity to walk on dry land. More excitement comes with the onboard helicopter. Being able to see the country from a spacious and comfortable five-seater helicopter, with a guide, gives it an extra dimension of fascination. One of the my favourite excursions is a picnic next to an incredible billabong with two huge swimming lakes and a couple of waterfalls for good measure. A swim in a billabong is something everyone should do in their lifetime – it feels really special to be swimming in fresh water in a part of the country where fresh water is so scarce. No crocodiles allowed! The only way to get there is by helicopter so everyone is escorted in groups. The crew rope up the tarps in the trees, fold out the chairs and tables, and set about preparing a delicious barbecue picnic to make it a real Aussie lunch. There are eskies filled with beer, wine and soft drinks, tasty salads and, on the barbie, meat and fresh-caught fish turned into succulent culinary creations by our chefs. What a fantastic day as the crew take a well-earned break to enjoy the oasis with us. Our crew director joins us at dinner each night to relay all the news of that day and plans for the next – where we are headed and what we might see and do. I really love that every day our surroundings transform. The landscape, the seascape and the colours seem to change daily, often dramatically, as if with each day we are entering a new world. And going up on deck to check out our current location never fails to be exciting. On one occasion, at King Cascades, the crew deftly steer True North right under the falls. On another, I watch astounded as the 362 square kilometres of coral that comprise Montgomery Reef rise out of the ocean as the tide subsides. The photo opportunities are simply endless and often I can’t help but snap off a million shots. However, I try to stay in the moment, as such amazing sights are best seen with your eyes and taken in with your mind. We go to bed exhausted each and every night because the days are so full. The crew makes sure we are always comfortable, always at hand with refreshments and that essential beer or wine at the end of the day. The True North crew is well-trained, experienced and always ready to go that extra mile to please. More than this, they love their work and the pristine locations they take us to. Fun to be around, they add to the enjoyment of the trip. In my case, they even offer a welcome shoulder to cry on when I lose that elusive barramundi I had on the hook for only a few precious seconds! My experience on the Kimberley Coast has encompassed wild rivers, cascading waterfalls, rugged gorges and rock formations, seagrass meadows, mangrove forests and coral reefs – all teeming with life. I have seen some of the world’s largest population of humpback whales and several major seabird breeding colonies. My experience has been a mix of expectation, excitement and exhilaration – all wrapped up in a luxury cruise liner package. This has been an experience so confronting, and yet so beautiful, that I will not soon forget it.